Editor’s Note: This article focuses on the Personal Hotspot feature introduced in February 2011 with the Verizon Wireless iPhone 4. Since then, Apple added the feature to AT&T iPhones through the iOS 4.3 update. You can find the version of this article that focuses on using the Personal Hotspot on an AT&T iPhone 4 elsewhere at Macworld.com. Throw away your MiFi! Forego the heartbreak of tethering! Give up the struggle of Internet Sharing from a mobile broadband modem through your laptop! The Verizon iPhone’s Personal Hotspot feature can slice (through your mobile bill), dice (up your cables), and make pounds and pounds of Wi-Fi devices connect to the Internet. But, wait! There’s more! Personal Hotspot does its job well, too. Personal Hotspot replaces and expands the tethering feature introduced on AT&T iPhones with iOS 4 (and for iPhones outside the U.S. with iOS 3). Tethering is a one-to-one connection that allows a single computer or other compatible device to use a phone as modem over Bluetooth or via a USB cable. Personal Hotspot includes both of those options as well as sharing via Wi-Fi. Setup and use is as simple as one might hope from iOS. First, you need to sign up with the service at Verizon Wireless by calling the company’s customer service line. You can also sign up for the service when purchasing a phone and plan. Verizon charges $20 per month for Personal Hotspot and includes a 2GB pool of data separate from the unmetered data usage available for apps, e-mail, and surfing. Additional gigabytes (partial or whole) are $20 each. The Personal Hotspot settings view lets you switch the feature on and off, and choose a password. Apple’s default password is memorable and quite strong. With your plan enabled, launch Settings, and tap General -> Network -> Personal Hotspot. After you turn on the hotspot for the first time, the Personal Hotspot item will then appear at the top level of the Settings app. You’ll notice the Personal Hotspot screen is full of information, explaining how to connect via Wi-Fi, USB, and Bluetooth, since all three options are available. Apple requires a password for the hotspot Wi-Fi network. You’ll be grateful for this, as it means that you can’t accidentally open the network to anyone and have them run up a huge data bill. The password Apple prefills is unique, easy to remember, and quite strong: a word, two numbers, and then another word (like “penguin87walrus”). No brute-force method known to humanity can currently crack such a password. You may replace that password by tapping in the field. A password must be at least eight characters long (a mix of letters, numbers, and punctuation), but security experts recommend at least 10 characters, with at least one number or mark in there. The iPhone will warn you when you turn on Personal Hotspot whether either or both wireless adapters, Wi-Fi and Bluetooth, are disabled and give you the opportunity to turn them on. The hotspot feature requires Wi-Fi’s WPA2 Personal protection, a seven-year-old encryption standard that’s available in all AirPort base stations and cards shipped starting in 2003, and in nearly all other Wi-Fi gear shipped since 2003 or 2004. If you have an old iBook with a plain old AirPort Card in it, or a device that only offers the original 802.11b flavor of Wi-Fi, however, it won’t be able to join the network. A blue bar appears at the top of the screen when a device is connected to the hotspot, much like the green bar that shows an active call when you’re not in the phone app. Tap the bar to open the Personal Hotspot setting screen. The bar displays a count of connected devices, including USB and Bluetooth. If no devices are connected by any network method, the Wi-Fi radio will power down after 90 seconds, and the hotspot will no longer broadcast its availability to Wi-Fi devices. Just unlock the phone, and navigate to the hotspot settings screen to wake it from its slumber. In testing, I occasionally also had to toggle the hotspot switch to Off and back to On to reactivate it. 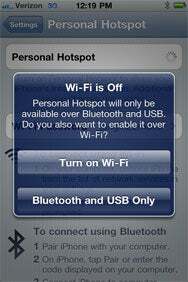 When any device is connected to the iPhone and active via Bluetooth, Wi-Fi, or USB, a blue bar shows the hotspot feature is in use as well as the number of connected devices. Because Personal Hotspot looks to a computer or other device just like any Wi-Fi connection, you can carry out any task and use any service. This includes FaceTime on an iPhone or iPod touch relayed through the hotspot (not on the iPhone running the Personal Hotspot feature). Throughput seems to be about the same whether you’re using apps on an iPhone or connected to the phone as a conduit to the Internet. In Seattle in two indoor locations, I was unable to beat 500 Kbps, while my AT&T iPhone topped 1 Mbps. Your mileage will absolutely vary, although AT&T’s network, in areas with good coverage, will almost always be faster than Verizon’s due to the current generation of mobile broadband technology in use by each firm. If a phone call comes in while you’re using the hotspot feature, the CDMA iPhone keeps all devices connected, but suspends Internet access until you accept or reject the call. If you answer the call, the hotspot continues to remain active without Internet service; the net comes back when you hang up. If you reject the call, Internet access resumes. Things get complicated if your iPhone is within range of a Wi-Fi network to which it has previously connected. With Personal Hotspot turned on and at least one device connected by Wi-Fi, USB, or Bluetooth, the iPhone will force a connection to Verizon’s 3G network, and maintain the hotspot connection. 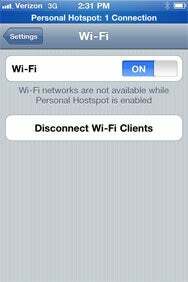 However, if no devices are connected, when the hotspot feature slumbers, the iPhone switches to the available Wi-Fi network. You can also switch to using a Wi-Fi connection for Internet access with the Personal Hotspot active. Navigate to the Wi-Fi setting, and tap a button—Disconnect Wi-Fi Clients—that only appears if you have folks connected by Wi-Fi. While that option won’t show up if Bluetooth or USB tethering is in use, the iPhone still only uses 3G for the feature; it won’t share a Wi-Fi connection. If devices are connected via Wi-Fi using Personal Hotspot and you want to bump them and switch the iPhone to use a local Wi-Fi network instead of Verizon’s 3G service, you can tap Disconnect Wi-Fi Clients instead of turning off the Personal Hotspot feature. When you’re ready to turn the hotspot feature off, use Settings to tap the Off button in the Personal Hotspot item. In my testing, Personal Hotspot used a reasonable amount of battery power, and noticeably drained the iPhone over time, but it’s nothing compared to, say, an active GPS navigation connection. You could likely use Personal Hotspot for several hours of routine use (not continuous streaming or downloads) starting with a full charge. I recommend plugging in an iPhone via USB or a power adapter to avoid running out of juice. Because iOS puts the hotspot feature to sleep when nothing’s connected, you can leave it turned on and essentially in standby when you’re not using it. The biggest worry you might have with the feature is burning through data. You are likely more aware of the bandwidth you’re consuming on an iPhone, which automatically throttles certain kinds of data usage when connected via 3G: streaming slows down, you can’t download music, movies, and apps larger than 20MB, and other more subtle techniques make the phone less talky. But connect a laptop or mobile device via Wi-Fi, and you might use up the monthly allowance by retrieving an iOS GPS navigation update.